This entry was posted on Monday, April 8th, 2019 at 9:45 am and is filed under Announcements, Economics, Homeland Security, Illegal Immigration, Law Enforcement, Outrage, Pres. Donald Trump, Those Dems. You can follow any responses to this entry through the RSS 2.0 feed. Both comments and pings are currently closed. Donald Trump was overwhelmingly elected President of the United States on his pledge to secure our southern border and build a wall. He must find a way around the only wall that exists in Washington, DC…that’s the hostile wall constructed by the democrats who view these invaders as new party members. I used to view dems as “just another party.” Now I see them, even my relatives and co-workers, as committed enemies of this country, our citizens and my kids and their future progeny. Their actions are not benign. They are encouraging the overtaking of our Constitutional Republic by masses of illiterates from Socialist countries, which they will replicate here. I have the same feelings of resentment. We are quickly losing our country to hundreds of thousands of people who sap our resources, engage in crime and refuse to assimilate. They bypass our legal immigration system, which the dims repeatedly tell us is “broken.” It is not broken, but their will to enforce it is nonexistent, because, in the short term, they benefit from the invasion. But they have families, too. Are Congressional dims so short sighted and single focused that they want their children and grandchildren living in conditions that the invaders recreate here?? If you haven’t visited Tucson in a while, come down. Except for the growing number of gated communities, it’s Mexico Norte. (Ret) General John F. Kelly, who was President Trump’s WH Chief of Staff. Please remember that President Trump is surrounded by swamp dwellers, some who are overtly globalist/anti-sovereign U.S.A, and some who are closeted swamp creatures. To weed them out, you sometimes have to allow them to show their hand. If you read her lengthy resignation letter, it might cross your mind that she may have written the first and last paragraph, with the rest of the DHS highlights being suggested or written by someone else. What you must remember is that the cancer that threatens to kill us (US) is a disease that has spread worldwide and has an endless supply of morphing cells—the “deep state”, the “cabal”. Why doesn’t the President simply throw down the gauntlet? Because the bad guys, foreign and domestic, have set a large number of “dead man switches”, that if activated, would set off huge catastrophic events. Much worse than the false flags that we have seen here and most recently in NZ. Please pray for President Trump; him family; his Loyal team, and our U.S. Military. President Trump recently called our military “saviors of mankind”. He was trying to tell you something. Everything he says–everything he tweets—has more than one meaning. And the message is not always for us. 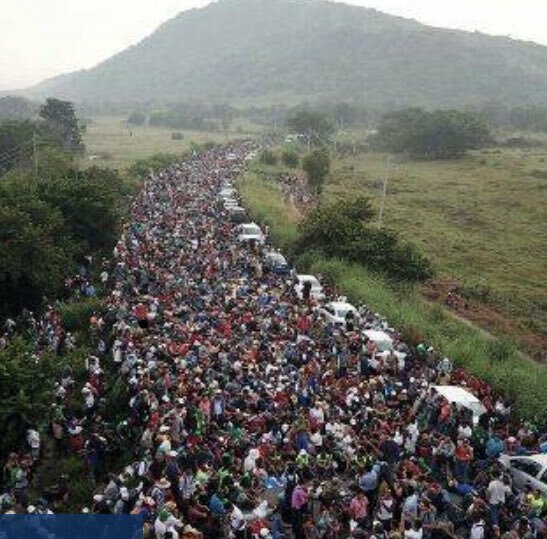 Anyone who voted to put Democrats in public office bears responsibility for this invasion. By public office, I’m not limiting it to the US House and Senate. State legislatures also make laws. Governors and Mayors call the shots in states and cities. City Councils have voted in favor of homeless men defecating on California streets. Law enforcement have their hands tied by these low level city and county manipulators. Sanctuary cites are the result of their actions. Allowing criminal illegals to repeatedly return w/o consequences to engage in more drug trafficking, rapes, DUI’s and wrong-way drivers.killing law abiding freeway drivers and their passengers. And let’s not forget the toll taken by illegals who engage in murders. They are not swallows “migrating” from Argentina to Mission San Juan Capistrano in California each March 19th. The birds return to Argentina. These people are invaders, They stay and sap our resources while frequently committing additional crimes. Illegal proponents say they are not criminals. To counter that, invite someone who parrots that fallacy to the downtown courthouse and show them the computer screens outside the courtrooms listing the defendants and their crimes. The facts are undeniable. CNN’s Chris Cuomo had a conversation with an illegal alien, with the help of a translator, about why the man decided to come to the United States. The questions Cuomo asked confirmed what President Donald Trump and the Republican Party has said for the past few years: illegal aliens are coming to America for jobs, not because they’re truly seeking asylum from a dangerous government. “Is he here to work or is he here for asylum?” Cuomo asked the translator. “He wants to work but if he gets asylum he’s willing to get asylum,” the translator told Cuomo. “Why did he take his kid with him to come here if it’s just to work?” Cuomo asked. “It’s what you and I were talking about. He says that if he comes here with his son then he’s allowed to stay,” the translator responded. People who are unvaccinated, and whose state of health is unknown. The children are prime candidates for being trafficked. Rush hit the nail on the head the other day. He asked the question if any of us really thought that these thousands of people from multiple countries in Central American thought to come to the United States at the same time? Did thousands of people just get up and start walking to the United States without worrying about food, water or sanitary issues. How about those who sent their children. Did they walk out to the road, point North and tell their kids go until you reach the United States? He, and many of us, believe that some organization is behind this mass migration of people. Some group is trying to weaken the United States to the point that they can take over the country. Do we really feel that Mexico was OK with all of these people relieving themselves along side of the road for fifteen hundred miles? Today we were told another two caravans are on their way. We need to stop this. Trump campaigned on closing the border, now do it! Don’t tell me the democrats are preventing him from acting. He has the will of the people behind him. All very cogent points! Mexico has facilitated this invasion. They obviously think they will benefit from the United States failing. They’ve done such a great job with their own country, filled with corruption, roving gangs, drug cartels, blood and gore as they control the press, law enforcement, military and judiciary, killing anyone who stands in their way.We used to travel there on vacation. Haven’t for years. The resort we stayed at during our final trip nearly a decade ago warned all guests to stay on the property.